Update: The original painting has sold. Prints and T-shirts featuring this painting have been added to the gift shop. 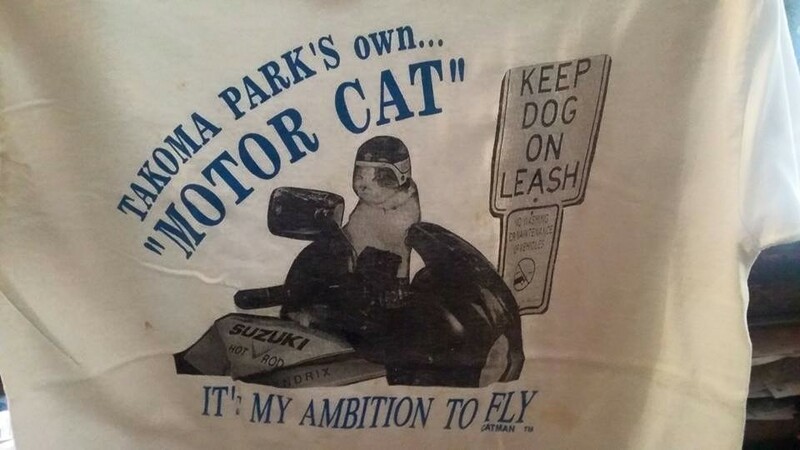 Photo of Motor Cat T-Shirt from the 90s. 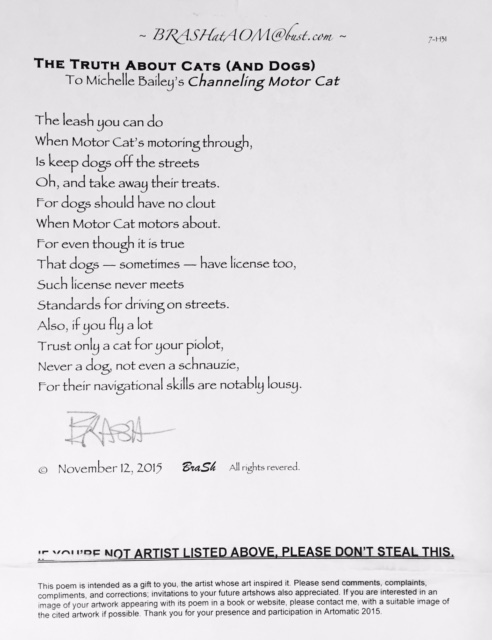 Artomatic Update: Channeling Motor Cat got BRASHED at Artomatic 2016! Also Available – Channeling Motor Cat T-Shirts and prints. So cool & what a great story. Karen Santos liked this on Facebook. Laura Schnitker liked this on Facebook. Anna Olsson liked this on Facebook. James S. Adams liked this on Facebook. Karen Powers liked this on Facebook. Deirdre McIntyre liked this on Facebook. Kama-Love P. Carmichael liked this on Facebook. Sheila Equality Thomas liked this on Facebook. Jean Podrasky liked this on Facebook. Mary Lynn Korch liked this on Facebook. Celine-Marie Pascale liked this on Facebook. Alison Keefe liked this on Facebook. Nike Carstarphen liked this on Facebook. 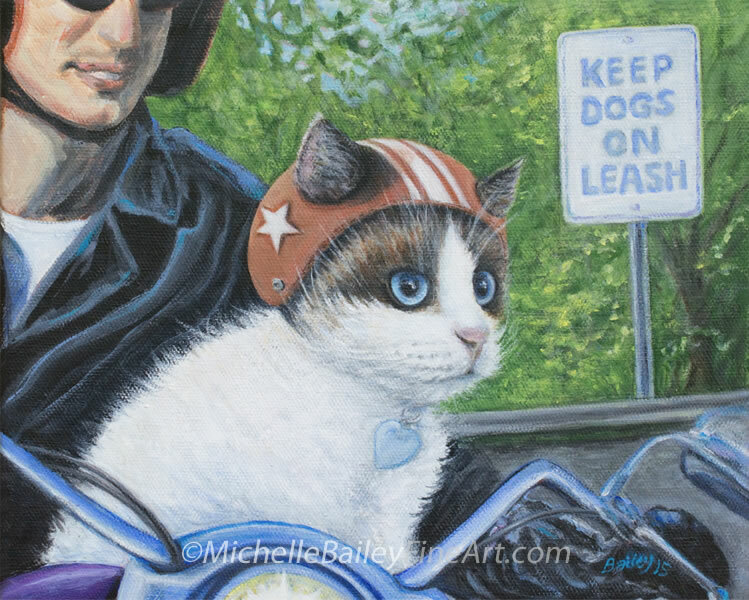 I LOVED seeing Motor Cat back in the day! 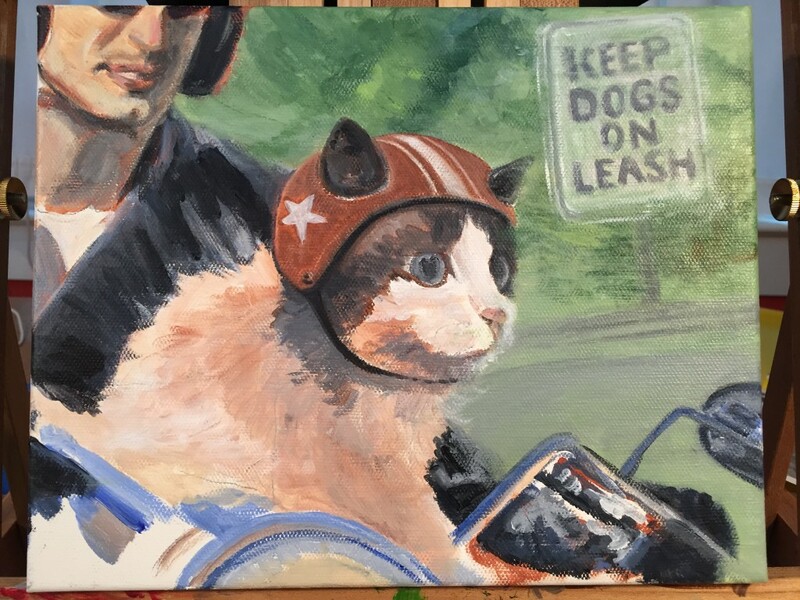 What a great idea to create a painting inspired by Motor Cat!! Motor Cat got an obituary in the Post when she passed. She was a TP icon and your painting will make a lot of people smile. Lorie Shaull liked this on Facebook. Anita Ohlsson liked this on Facebook. Cathy Schaeff liked this on Facebook. Really, that is so cool, please send me a photo of the t-shirt if you find it. I so wish I had one! Laura Mooney liked this on Facebook. Adele L. Abrams liked this on Facebook. Marcelle Fozard liked this on Facebook. Anita Broccolino liked this on Facebook. Cher Ree liked this on Facebook.